Look like a snow queen in this lovely ice skating dress. Let it snow! Off-the-shoulder looking long sleeves in mesh. Sleeves have fingerpoints. 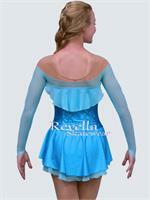 Beautiful, sweetheart shaped bodice in hologram spandex looks just like ice. 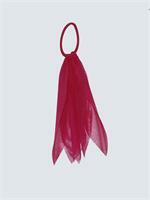 Delicate mesh drape in the back simulates a cape. Ice skating skirt has a front split in the top spandex layer, and a mesh layer below for added details. 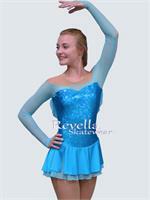 You will feel like royalty in this ice skate dress! Ice skating dress shown in turquoise. Also available in baby blue. Want a different color? Simply choose 'custom colors' from the drop down menu, then select the color you want from our optional color choices below. Optional colors are available on all of our ice skating dresses. Search terms: frozen, long sleeves, ice princess, ice queen, competition, ice skating dresses. Elastic band with strips of fabric attached for ice skating dresses.